Mentos is a brand of mints, of the “scotch mint” type, sold in many markets across the world by the Perfetti Van Melle corporation. 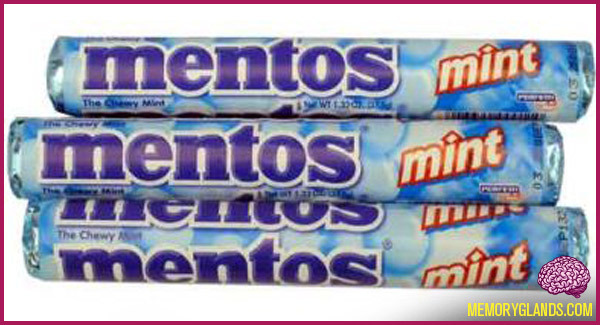 Mentos was first produced in the Netherlands during the 1950s. The mints are small oblate spheroids, with a slightly hard exterior and a soft, chewy interior. They are sold in rolls which typically contain 14 mint discs, although the new “Sour Mix” flavor contains only 11 discs per roll. Certain flavors are sold in boxes in Australia, the United States, Brazil and the United Kingdom, and the rolls are available in four packs. The slogan of Mentos is “The Freshmaker.” Most Mentos packages describe the mints as “chewy dragées.” The typical Mentos roll is approximately 3/4-inch in diameter, 6/16-inches long and 37.5g.